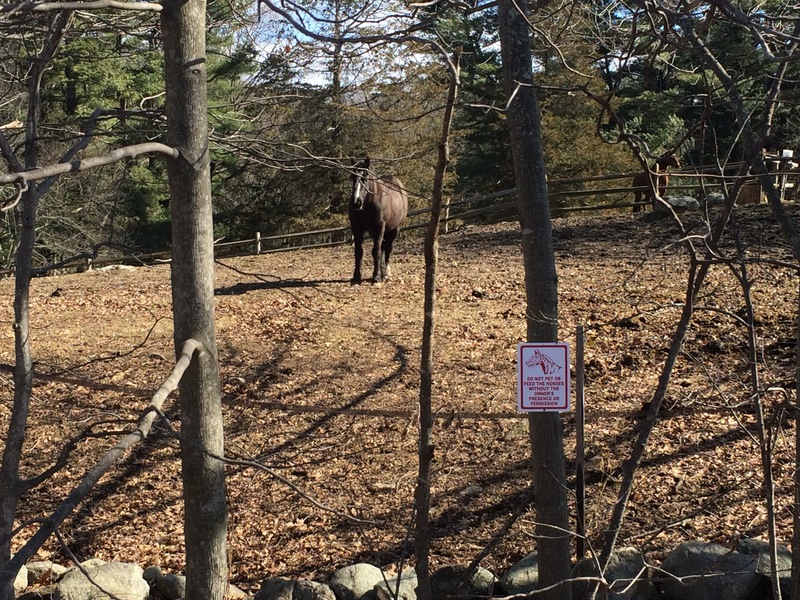 Zelda’s pasture is right next to an access road that leads into a popular trail system and at this time of year — with no leaves on the trees — the horses are very exposed. And, apparently, inviting. 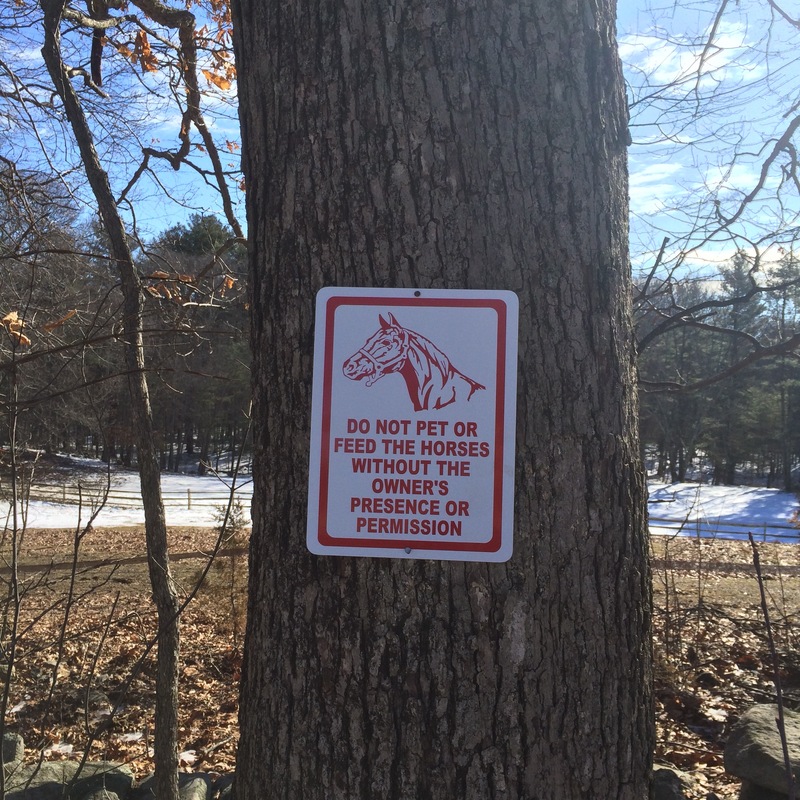 Please note that I have put signs up asking people not to feed or touch the horses and that they have to walk off the trail system to lean over the fence. Judging by Zelda’s behavior, some of the walkers have been offering treats. How do I know? Because either Zelda is practicing for a new career as a Walmart greeter, or she expects that these walkers are the human equivalents of Pez dispensers. It’s hard to resist Zelda when she’s in her endearing, feed me mode. But I wish that people would. In fact, watching the general public interact with the horses has given me new respect for private property . . . and the potential liability if people don’t keep on their side of the fence. And I’m not just worried about the horses. God only knows what people are feeding them, and I bet they won’t be around to ‘fess up to the damage if one of them chokes or gets sick. Frequently, dogs come into the pasture. Sometimes, but not always, unaccompanied by humans. Mostly, they ignore the horses, but the potential for damage (of either dog or horse) is certainly a distinct possibility. One time I asked the walker to keep her dog on a leash if she couldn’t keep it out of the pasture. She told me she “didn’t need to leash her dog” until she got to the road. Wrong. I guess I have to add a line that includes “Do NOT reach over the fence, or let your small child or dog enter the pasture. Then there’s the mother who dangled her baby over the electric fence so the child could see the horses. I guess that mother has no imagination because it would take just one swing of Zelda’s head to send them flying like bowling pins. Folks, this is not a petting zoo! Even people who should know better . . . don’t. Last week I was fixing some fencing and I saw a man walk up to the fence line. “Please don’t touch the horses,” I asked. “I’m just trying to be friendly,” he answered. “I have horses.” Great, so go touch your own horses. No, I didn’t say that. Instead, I explained that every time people see someone patting and/or feeding the horses, they think it’s okay. And those people may not know how to behave. Unimpressed, he stalked off. Finally, I came up with a solution. Not to the dogs, but I hope to the people. I’ve put up new fencing to keep the people out! So now, we have a fence inside the fence. More to keep the people out than the horses in. 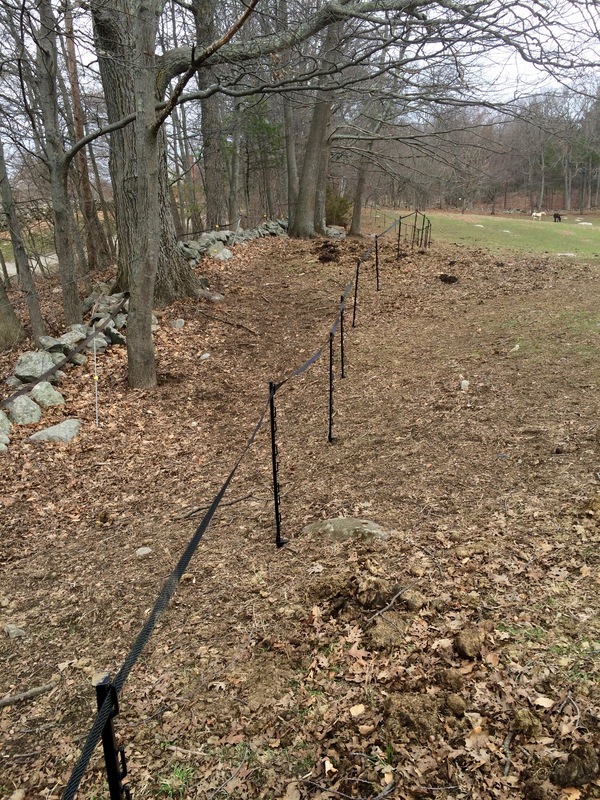 Is the new fence electric, too? :). As for the mom with the baby…good grief! Her child could also have gotten zapped by the fence! Two or three years ago I had a neighbor who loved my dog. That’s great! Love on her. Pet her. That’s plenty. But he felt the need to give her treats each day – without asking me first. Not only is this not great because she is on an allergen free diet, but it’s also not great when you are trying to keep her weight at a certain level. What was his treat he gave her? Bread. Bread! She gained four pounds! When I moved elsewhere she seemed hungrier at first. I realized it was because she wasn’t getting her daily dose of bread. haha But, she lost those four pounds plus one or two more after I moved. I know people think they are being kind when they feed your animals treats. What they don’t understand is that not everything is suitable to feed and/or that your pet might be on a restricted diet. Zelda’s pasture-mate has a history of choke, so the carrot or apple that’s offered with the best intentions could backfire and cause a serious medical issue. Hey Jane, good to “see” you here again. Hope you, Hudson and the rest of your family are well. Golly I know your struggles, we’ve had similar problems. When I asked one woman to put her dog on the lead after it ran into the paddock she declared that her dog was fine with horses. Of course I replied that my horses weren’t fine with her dog (even though they were) & to please leash it. Not a happy lady. Another time I had to stop children throwing apples at the horses 😦 This feeding of other people’s horses can be a nightmare. A friend of ours ended up with a vet bill for her 32 year old cob due to passers by feeding it raw sugar beet! Another friend has a constant battle with a disabled woman in an invalid carriage who brings apples to her shetlands. Despite explaining to the “feeder” that her ponies are laminitic and on specific diets this person simply refuses to desist from feeding the ponies! I could go on…. There have been times when I’ve found little mini carrots in the paddock which I knew that I didn’t feed and which the horses must’ve missed. The best one happened at my old barn. I was inside the barn when a woman I didn’t know walked into the field with a plastic bag full of carrots. She had a large dog next to her (not on a leash) a toddler by the hand, and a baby on her hip. Within seconds she was surrounded by four horses, all of whom wanted one of those carrots NOW. After I rescued them (unscathed) I asked why she thought it was a good idea to come into the field and she told me the daughter of the property owner had told her it was okay to feed the horses. Sigh. And yet I’m sure it would have been my fault if anything had happened. People just have no boundaries any more.